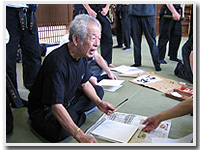 Dr. Hatsumi founded the Bujinkan, which means “Divine Warrior Hall,” in honor of his teacher, Toshitugu Takamatsu. The nine warrior schools of the Bujinkan hail from the ancient battlefields of Japan; six are old samurai schools, the remaining three are schools of the oft-misunderstood ninja. These historical roots provide a mine of rich teachings that are equally applicable to modern situations, teaches Dr. Hatsumi. Dr. Hatsumi preaches the importance of understanding the principles underlying techniques, not just the mechanics–things that will serve the greatest benefit in the flurry of a real battle. This practicality is the Bujinkan’s biggest draw for 200.000 of practitioners around the world, many of whom are involved with law enforcement or personal security. Dr. Hatsumi, a former bone-setter, has penned over a dozen books, has published over 60 DVD’s, and is the former chairman of the Writers Guild of Japan. For his efforts to spread the art of the Bujinkan throughout the world, Dr. Hatsumi has been recognized by many governments, private organizations and distinguished individuals. Awarded the International World Culture Grand Prize for Peace and Culture by the Japanese government. The award, the highest honor given for cultural exchange, was presented to Dr. Hatsumi by a member of the Imperial Household on November 22, 1999. Certificate of friendship from former American president Regan, Bush and Clinton, the King of Spain His Majesty Juan Carlos, President Mitterrand of France and Prime minister of England Major. 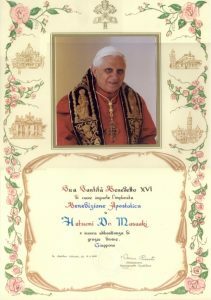 February 2007, Grandmaster Dr. Masaaki Hatsumi received from Pope Benedicto XVI, a greeting and an Apostolic Blessing. 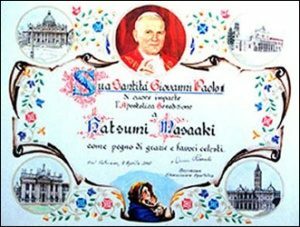 In a distinguished diploma together with the Apostolic Blessings, the Pope added wishes for Abundance and Divine Grace for Japan. 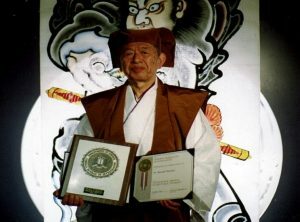 Masaaki Hatsumi, founder and grandmaster of the Bujinkan Dojo, has been awarded the International Culture Award by the Japanese government. 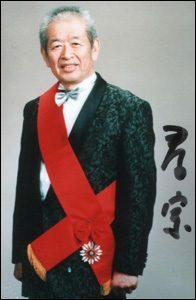 The award, the highest honor given for cultural exchange, was presented to Dr. Hatsumi by a member of the Imperial Household on November 22, 1999. “This award is a great honor for the Bujinkan,” stated Dr. Hatsumi at the presentation ceremony. Dr. Hatsumi is the 92nd recipient of this prestigious honor to date. Dr. Hatsumi was nominated for his cross-cultural leadership in martial arts instruction. Blackbelt magazine´s 1986 Instructor of the Year, Dr. Hatsumi is best known for “opening the doors” to Ninjutsu to non-Japanese. 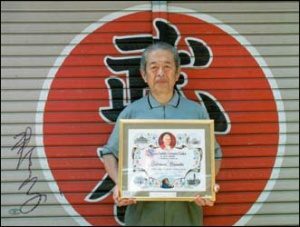 As grandmaster of the Bujinkan dojo, Dr. Hatsumi actively travels the world to share the teachings of Budo Taijutsu as passed to him by his teacher, Toshitsugu Takamatsu. Each year, Dr. Hatsumi holds two international Taikai (gatherings) for training, usually alternating between Europe and the United States. Additionally, hundreds of eager students from scores of countries also converge on Japan for training with Dr. Hatsumi each year. 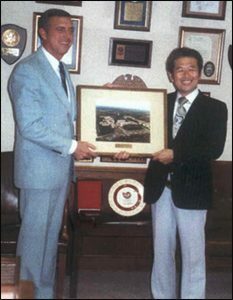 December 2005 Dr. Masaaki Hatsumi received an award and a certificate of appreciation from the FBI for his training of its members. 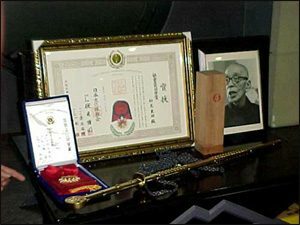 On February 29th 2007, Grandmaster Masaaki Hatsumi received a medal granted by the Sicilian Delegation of the Sacred Military Order “Costantiniano di San Giorgio”. The knight and member of the San Giorgio Order, Mr. Francesco Stagno d´Alcontres, is a member of the Bujinkan and bestowed with great affection and admiration as a knight of tolerance and justice. Dr. Hatsumi has written numerous books and articles on philosophy and martial arts that have been translated into many languages. He writes a weekly column for a local Chiba prefecture newspaper and is a recurring subject of the major Japanese martial arts magazine, Hiden. For his efforts to spread the art of the Bujinkan throughout the world, Dr. Hatsumi has been recognized by many governments, private organizations and distinguished individuals. 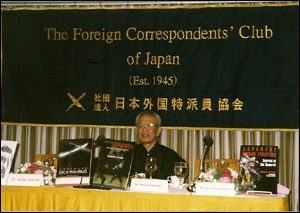 During the above ceremony, he was recognized as honorary member of the “FOREIGN CORRESPONDENT´S CLUB OF JAPAN”, for all his books produced during these past years in Japan and abroad. At this time, the Grandmaster presented his latest three books of the Kodansha printing house. Presenting a talk on Ninjutsu to Crown Prince Akihito (the current Emperor) at Gakushuin University. (世界忍者戦ジライヤ Sekai Ninja Sen Jiraiya, translated as World Ninja War Jiraiya) Tetsuzan Yamashi (Hatsumi Sensei) with director and his co-stars Maki Fuyukichi and Ose Koichi. Hatsumi Sensei takes a break to pen traditional brush paintings for students who hustle to his side with paper. Dr. Hatsumi is a recognized artist with pen and the traditional brush. Observing his movements when painting is like watching his flow over the tatami mats in the dojo when practicing combat drills with students from around the world. So effortless and with such a precession, distance and timing. At the trainings at Bujinkan Hombu Dojo (Head training hall in Japan). 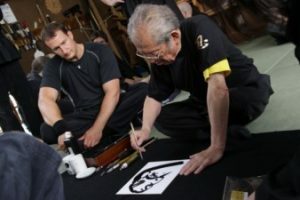 Dr. Hatsumi often use the brake, from the combat training, to paint for his students. Dr. Masaaki Hatsumi is a recognized painter, whose paintings have been shown at important exibitions around the world, following is a small sample of some of his work. 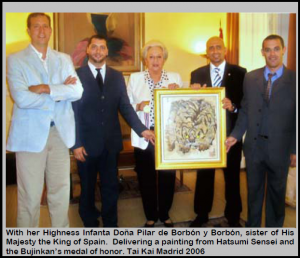 Below is one of Dr. Masaaki Hatsumi´s paintings as a gift to her Highness Infanta Dona Pilar de Borbon y borbon (sister to phis Majesty King of Spain).